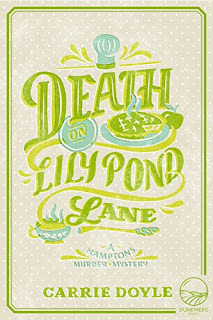 Death on West End Road is the third book in the Hamptons Murder Mysteries by Carrie Doyle. Also available: Death on Windmill Way and Death on Lily Pond Lane. 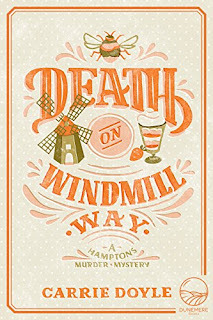 Death on West End Road is currently on tour with Great Escapes Virtual Book Tours. The tour stops here today for a guest post by the author, an excerpt, and a giveaway. Please be sure to visit the other tour stops as well. Like a basket of warm cinnamon buns, an unsolved crime is something that Hamptons innkeeper and sleuth Antonia Bingham just can’t resist. Despite a busy high-season schedule and an inn booked to capacity, Antonia has agreed to investigate a cold case in her beloved adopted hometown, East Hampton, NY: the killing of Susie Whitaker, whose brutal 1990 slaying on a tennis court in the poshest part of town was never solved. And the person who has hired Antonia? Prime suspect Pauline Framingham, a manipulative pharmaceutical heiress from a powerful family. The crime scene is compromised, the circumstances are complicated, and former witnesses are cagey, haunted and very reluctant to revisit what happened on that sun-splashed afternoon decades earlier. As Antonia attempts to unravel the mysteries of the past she unearths even darker secrets and ultimately wonders if it would have been best to let sleeping dogs lie. To make matters worse, past acquaintances and love interests reappear in the Hamptons, disrupting Antonia’s world and causing her to scurry to the fridge for comfort. 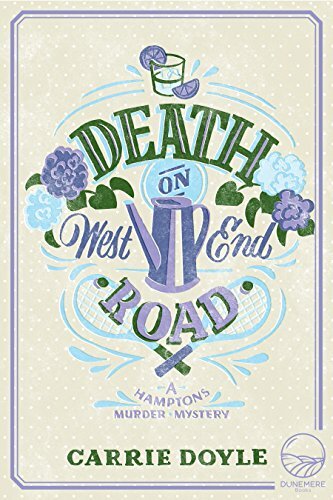 Death on West End Road is the third book in the Hamptons Murder Mysteries. 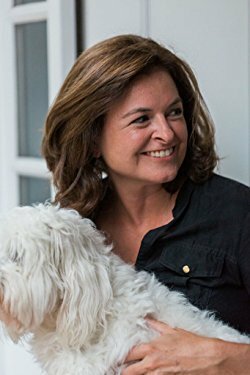 Along with a colorful cast of supporting characters, the beating heart of the book is Antonia Bingham, restaurateur, gourmand, and nosy carb-lover. I recently had a conversation with a writer friend of mine that left be shocked. The more I think about it; the more shocked I am. I had to bite my tongue. This friend is a good writer, who has published books with renowned publishing houses, and met with some success. But that said, by no means is he Shakespeare or Tolstoy, or even Michael Connelly for that matter. His writing could be better, his career has stalled somewhat, and it is my deep belief that he is wrong. In fact, the more you read, the better you write. “Make sure to reread,” was the mantra that best selling author Mary Gordon, my English professor at Barnard College, repeated every day of the semester when I took her class junior year. It was not sufficient to read a great book once, she cautioned, but many times over many stages of your life. I think of that often. I was young and still in school when I read Madame Bovary, Anna Karenina, and Pride and Prejudice. Although I appreciated those books then, what did I really know about the challenges of marriage or the financial implications of a relationship or society’s class structure? A good book can resonate with you depending on the time you read it. There are different facets to a novel that you can relate to at different times. I thought of Mary Gordon when I recently reread Jane Eyre, a novel I hadn’t read since sixth grade. I was surprised by how much I remembered, but I was also struck by how my impressions of the book were so different. What I enjoyed most of all was Charlotte Bronte’s wonderful descriptions of nature, something I am certain I didn’t pay attention to the first time. Because I write a series that takes place in the same locale every book - East Hampton - it’s important for me to take note of the landscape and try and find new ways to express the beauty of the village. Reading a book like Jane Eyre inspired me. On so many levels reading is important: learning about a new place; being transported to another world; experiencing a range of emotions. But if you are writer, there is no greater tool or inspiration than reading as much as possible. It will make your writing better. Carrie Doyle was the founding Editor-in-Chief of the Russian edition of Marie Claire Magazine. She is currently a Contributing Editor of Hamptons Magazine and has written extensively for Harper’s Bazaar, Town & Country, and has also written for Women’s Health and Avenue on the Beach. With Jill Kargman, Carrie (as Carrie Karasyov) co-wrote the film Intern (which premiered at the Sundance Film Festival in 1999), as well as several screenplays sold to Showtime, Paramount Pictures, Nickelodeon Films and the Oxygen Network. Carrie and Jill co-wrote five books together, including three teen books for HarperCollins and two bestselling women’s fiction books, The Right Address and Wolves in Chic Clothing (Broadway Books). Carrie also penned the popular novel The Infidelity Pact (Broadway Books). Carrie lives in New York City with her husband and two children and is currently at work on an animated series for broadcast as well as her new series, the Hamptons Murder Mysteries. Enter the tour-wide giveaway for a chance to win one of three "Hamptons Summer" gift packs, including a beach bag and print copies of all three books in the series (US only).